What must Bruno Sacco think? Am I alone in thinking that Mercedes-Benz's visual vocabulary is becoming ever more confused? The big three pointed star in the middle of the grille was the preserve of the SL series from the original 300SL onwards, for the wholly logical reason that the traditional Mercedes Benz "radiator shell" would have looked ridiculous on a low aerodynamic sports car. Then the W126 S-Class coupe adopted the central star and the floodgates opened. 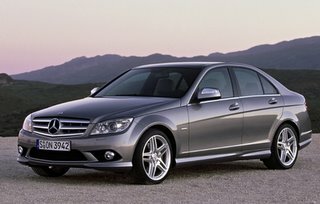 Not only did it re-appear on the second series CLK and the CLS, which had some sort of logic, but also on the M-Class, A-Class, and R-Class, which had none at all. What's stranger is that the vans and trucks are mimicking the passenger cars. Previously they carried the three pointed star as a discreet badge in the middle of a horizontal black grille, in 1970s Volkswagen style. Now the sculptured grille and oversize badge are near identical to those of an M or R-Class. The handsome offering above is a Sport version of the new C-class saloon*. The ones which do not distinguish themselves at games have the latest version of the Mercedes Benz "radiator shell", rather handsome with its historically correct 'V' shape in plan. I'm afraid in Sport form it reminds me of nothing so much as the vulgar mock-SEC grilles which were a favourite means of ruining a 190E in the 1980s and 90s. It's distressing to know that by the first decade of the 21st century, a reminder of such sacrilegeous bad taste is now a factory option. *Not Vectra, not Hyundai, not Kia, not Honda, as they say in e-bay speak.